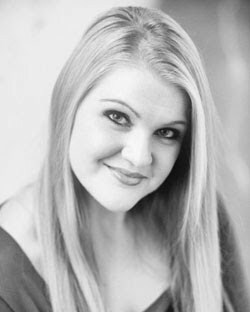 Those who follow our Young Artists Program might recognize our Three Ladies: soprano Anya Matanovic, soprano Marcy Stonikas, and mezzo-soprano Lindsey Anderson. 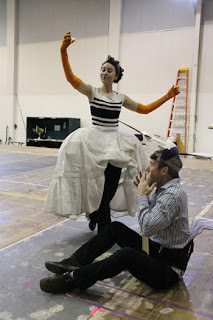 Matanovic was a Young Artist in 05/06 and 06/07, and made her mainstage debut last season as Nannetta in Falstaff (she's pictured on the right, in a photo by Alan Alabastro, as she rehearses with Philip Cutlip); Stonikas and Anderson are current Young Artists, with Stonikas making her mainstage debut in The Magic Flute, and Anderson following up her role as Alisa in last fall's Lucia di Lammermoor. Today, we speak with this lovely trio and find out what else they've been up to lately...as well as what the Three Ladies actually do with all the birds they buy from Papageno. In the first scene, Tamino faints and the Three Ladies quickly dispatch his serpent for him—and then fall madly in love with him. What is so attractive about this guy? MARCY: In general, I think these ladies are a little attention-starved. We're used to working for the Queen and doing all of our tasks together, but a man is something new and unusual to us. I'm sure we see and slay monsters much more often than we see a handsome, young prince at such a close distance. ANYA: Yes, we take care of business like that every day, so it really isn't that big of a deal to defeat a huge, deadly monster for us. But the temptation of love…well, that sparks something entirely new in each of us. Tamino is the most handsome and brave man we ladies have seen and I think it really takes us by surprise. Of course, I discover him first—and if only I didn't SING every darn thought I had, the other two ladies wouldn't have taken notice of him…and then, believe me, this opera would end VERY differently. LINDSEY: Life in the Queen's kingdom has become very boring and predictable. The Three Ladies sit around for hours on end listening to the Queen brood about betrayal, and then go for their daily outing to collect birds from Papageno. On a busy day they may have to kill a monster or two. But Tamino's arrival puts an end to their monotonous way of life. 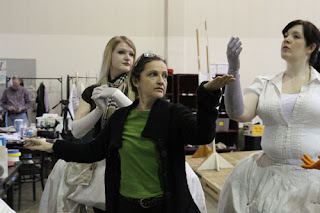 Lindsey Anderson and Marcy Stonikas work with choreographer Rosa Mercedes during rehearsals for The Magic Flute. The Queen has a complicated relationship with her daughter, but how do the Three Ladies feel about Pamina? MARCY: The Ladies like Pamina. We don't have a complex relationship with her, as her mother does. We probably think of her as a little girl still and think of her fondly. LINDSEY: The Three Ladies share a strong sense of solidarity with the Queen, but I believe they still care for each other on a familial level. Pamina is like a niece to them and they care for her very much. What do the Three Ladies do with the birds they purchase from Papageno every day? MARCY: We eat the birds, of course. LINDSEY: And maybe make a few new accessories with the feathers. The Third Lady's favorite recipe is Chicken à la King—or, in the case of the production, Emu à la Queen! ANYA: I'd like to think the First Lady goes about her days humming to herself and making wreaths of flowers for the beloved pet birds that the Queen lets roam freely around her quarters, and nuzzling the beaks of the babies in their nests. Anya, we hear you recently visited Slovenia, where your family is from. Tell us a little about your trip! Is there much opera being performed? Yes, it was a wonderful trip, and it had been 15 years since my last visit. My father's side of the family still lives there, in the capitol Ljubljana. Slovenia was the first country to leave the socialist Yugoslavia in 1991 and has a very rich history, with a wonderful mixture of Mediterranean and Alpine influences. It is a very special experience to wander though cities that hold so much history (Mahler studied in Ljubljana!). I could go on and on about the beauty of this country, but instead I will just say that if you have the chance to visit Slovenia - do it! Also, within a two-hour drive you can be in Italy, Croatia, Austria or Hungary. But the best part of my trip was reconnecting with my family. It was a very different experience to be there without my father, who speaks the language. As for the opera world, my impression was that there is a lot of opera being performed there. But that could be due to the fact that my two uncles and cousin happen to be some of the biggest opera fans I know! One of my uncles is president of the Wagner Society of Slovenia, and to say my other uncle is an "opera fanatic" might be an understatement. Slovenia has several small opera companies, and Zagreb and Graz are just a short drive away. And their favorite houses—Vienna, Barcelona, Zurich and Berlin, Bayreuth—are just a bit further away. They travel all over Europe, and occasionally to New York, to hear their favorite singers or see their favorite operas. 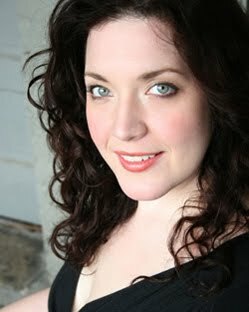 Marcy, you’re in two Mozart operas back-to-back with us, Don Giovanni with the Young Artists and now The Magic Flute. What do they have in common, and how are they different? Do you prefer one or the other? Don Giovanni and The Magic Flute are very different shows, with different themes, moods, and characters. For starters, our production of Don Giovanni only had nine people in it and The Magic Flute has what at times can seem like hundreds. Both shows have such beautiful, recognizably Mozartian melodies but that's really where the similarities end, if you ask me. Well, I lied: the other thing they have in common are the unmistakable musical nuances that help the audience understand the relationship between the characters—and that's an amazing thing! Lindsey, you had to sing the Flosshilde (lowest Rhinedaughter) line in Siegfried and the Ring of Fire a few months ago, and now you’re the lowest of the Three Ladies. Which trio is harder? Will you ever sing a middle voice in an ensemble? I love singing in ensembles. I find it very gratifying to join with other voices to create such beautiful music. The Rhinedaughter trio, overall, has longer vocal lines with numerous opportunities to celebrate dissonance, and the end product was stunningly beautiful. The music of the Three Ladies is completely different from the Rhinedaughters but still presents its own challenges. When singing in a trio that has such close-knit harmonies, rhythms, and crisp texts, you have to develop an awareness of what the others are doing so that your musical intentions as a group are clear to the audience. There is a certain ebb and flow between the vocal lines of the Three Ladies that contributes to making their music some of the most beautiful and evocative in the entire opera. Singing the lowest part is something I've grown accustomed to and enjoy very much, but as my voice is maturing and becoming more comfortable in repertoire that sits a bit higher, I'm sure singing the middle voice of an ensemble will be in my future.